Founded in 1883, the area known as Mount Dora was first named Royellou after one of the City's pioneers. The town later renamed after the lake that is a short walk from downtown. The "Mount" refers to the fact that the city sits 266 feet above sea level, which is a high elevation in Florida. Incorporated as a town in 1910 with 370 residents, the town now has a population of around 15,000 people. Today, the town retains its small town feel with rolling hills, stately oaks, beautiful lakes and historic buildings. The town is especially know for its spectacular Christmas decorations centered around the downtown park where every tree is covered with thousands of sparkling lights. Mount Dora is also known as having the best antique shopping in the state. The historic downtown area has a wide variety of antique specialty shops and restaurants most of which are open everyday. The popular Renninger's Antique Mall is located nearly with it's monthly antique shows and exhibits. Lake Dora, with it's beautiful waterfront Gilbert Park and famous lighthouse , is just a short walk from downtown. The Art Festival, Craft Fair, Car Shows, Live Theatre and more. The City hosts many annual events such as the popular "Mount Dora Arts Festival". This event attracts over 200,000 people each year and has been ranked among the top art shows in the country. Other events include craft shows, antique car shows, golf tournaments, bicycle festivals and plant and garden fairs. Throughout the year, Mount Dora also hosts many arts and cultural activities. You can enjoy live plays at the newly renovated Sonnentag Theatre at the Icehouse or concerts and recitals at the Mount Dora Center for the Arts. For fun and relaxation, fish off the dock next to the famous Mount Dora lighthouse, take a scenic cruise of the Dora Canal, enjoy a nature walk on Palm Island or just enjoy the sunsets on beautiful Lake Dora. Mount Dora is also the home of ERA Grizzard Realty. Located in downtown Mount Dora on the corner of 6th and Donnelly, our office is the largest Real Estate Brokerage in the area with over 140 agents Statewide. Stop by for a visit! There is always a Realtor on floor to serve you. If you would like to make an appointment for a tour of available area homes, please contact us. Eustis is a charming small town that is currently in the process of completely reinventing itself. In 2003, the Waterman Hospital, which dominated the downtown Eustis skyline for many years, relocated south to Highway 441. This move created a large new downtown area ripe for development. Eustis is a unique waterfront City with a downtown area virtually on the shore of Lake Eustis. The City docks are open to the public and it is possible to dock your boat and walk a short distance to dine at restaurants and browse the many small shops that line the downtown streets. Downtown Eustis is vintage Norman Rockwell, where one can walk brick-laid streets, feel the breezes from majestic Lake Eustis, smell homemade sourdough bread or see a play at the Bay Street Theatre. In 1993 Eustis was named a Main Street City, one of only a handful in the State. History buffs will enjoy a visit to the Clifford House, a Neo-classical Revival house serving as the Eustis Historical Museum. The 18-room mansion was built in 1911 and features pinewood floors, brass fixtures, six fireplaces and Italian tile throughout. The house was placed on the Registry of Historic Places on 1975. Weekly afternoon tours are available to the public. Ferran Park on the shores of Lake Eustis is a popular retreat among locals, the site of sailing regattas, 4th of July festivals, the Lake Eustis Fine Arts Festival, held in November and the Light Up Eustis Christmas celebration. The Eustis downtown merchants sponsor frequent street festivals with live entertainment and a popular monthly classic car cruise. The Eustis Lake Walk is a popular destination in the town. It is a modern concrete boardwalk with beautiful iron gates and railings where you can walk the lakefront and may even see someone catch a fish or two. The Lake Eustis Foundation was established to develop the new downtown area opened by the hospital's departure. New retail/office space is being planned on the first floor and 2 story townhouses above street level. The City of Eustis' motto is "The City of Bright Tomorrows". Nowhere is a motto more fitting than on this beautiful Florida City on the Lake. The City of Tavares, located on the north shore of Lake Dora, is the County Seat of Lake County. The Courthouse, police department, jail, departmental offices and courts are all located in the center of downtown. The Historic Courthouse, built in 1924, contains the Lake County Historical Museum, brimming with artifacts tracing the areas past. A pamphlet that outlines a walking tour is provided at City Hall. It leads visitors to several other historic buildings found in Tavares. This waterfront City has gone through a major renaissance in recent years. As "Americas Seaplane City", downtown Tavares has been transformed from the seat of government business to an attraction of major interest. For more information about the Tavares waterfront, click here. A number of popular restaurants are worth a visit. From Al's Landing on the waterfront, you can watch Seaplanes arriving and departing while you enjoy your meal. O'Keefe's Irish Pub is a short walk across the street along with a number of smaller waterfront themed eateries. Nearer to the government center, you will find the outstanding Casa Mia Italian Restaurant. The City of Tavares 4th of July fireworks display on Lake Dora is especially noteworthy. The fireworks are launched across the lake and the reflections off the water and the echoes from the surrounding hills make the show a unique experience. Another popular Tavares activity is a boat tour on the Dora Canal. The canal, which connects Lake Dora and Lake Eustis, runs through a protected wildlife area with towering cypress trees and abundant wildlife. Alligators are a common site, along with beautiful wood ducks, cranes, egrets and blue herons. In mid winter, you can occasionally observe a family of otters swimming and fishing in the canal. 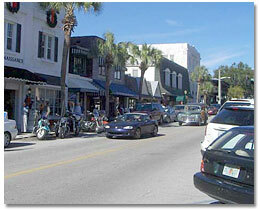 Located 6 miles west of Mount Dora, Leesburg is the main center of business activity. Perched atop Lake Wales Ridge, Leesburg attracts both the traditional retiree and the urban refugee escaping the hectic pace of the big city. The economy, once solely based upon agriculture, has become more diverse, anchored by a first-class airport, and industrial parks, as well as new business incentive programs and fast track permitting to encourage new business investment. The main shopping venue is the Lake Square Mall, featuring 80 specialty stores and a popular movie theatre. Leesburg's location, between two of Lake County's largest bodies of water, Lake Griffin and Lake Harris, make it no small wonder that boating and fishing are the two most popular pastimes for Leesburg residents. Newcomers are often delighted to find that Lake County's largest city has a downtown area that is a treat to the eye with its recently completed multi-million dollar streetscape project. The picturesque downtown is lined with old historical buildings, park benches, quaint little restaurants, gift shops, antique stores and businesses to meet the needs of both residents and visitors alike. The City was named as a Florida Main Street City in 1994 when the Downtown Business Association, the City of Leesburg and the Chamber of Commerce formed the Leesburg Partnership in a united effort to preserve the town's heritage. The Leesburg Partnership has assisted in the City's revitalization projects by hosting many public events and festivals which include Mardi Gras Street Party, the Mardi Gras Ball, the Christmas Parade, the Main Street Christmas Stoll, and the famous Leesburg Bikefest, to name just a few. Umatilla is a small country town located north of the City of Eustis and south of the entrance to the Ocala National Forest. The vast Ocala National Forest is covered with pine forests and dotted with small spring-fed lakes. The downtown area has one stop light, a bank, a feed store, an Ace Hardware, a Beef-O-Bradys restaurant and a Pizza Hut. Driving through Umatilla on Highway 19, it's hard to realize this small City is the location of many large lakefront estate homes. Multi million dollar homes surround Lake Dalhousie and the Rocking Horse Stables north of town regularly holds jumping horse and show competitions. The numerous small lakes in the area provide residents with an affordable lakefront lifestyle. Most are spring-fed and crystal clear. Lake Umatilla, Lake Blanchester, East and West Twin lakes, the Holley Lake Chain, and Island lakes are among the most scenic. Fishing in these lakes is outstanding and very popular with residents. Howey is a quaint small town on Highway 19 just south of the City of Tavares. The town has a pretty waterfront area on the west side of Little Lake Harris with lakefront homes overlooking the waterfront. The town's founder, William J. Howey, started buying Lake County Land in 1914. By 1920 he had amassed about 60,000 raw acres for his "City Inevitable". The Florida Land Boom tripled Howey's enterprises and the City was incorporated in on May 8th 1925. The Florida legislature officially changed the name to Howey-in-the-Hills on May 13, 1927 to reflect the beauty of the lakes and hills which Bill Howey touted as the "Alps of Florida". Howey is the home of the prestigious Mission Inn Resort and Club. Two championship golf courses, a full service hotel, upscale restaurants, a marina and an extensive full time staff make this resort a popular with visitors and conventions. Numerous upscale Spanish style homes are located on the resort grounds and the Club has an active social calendar. If you have questions about our local cities, please contact us.